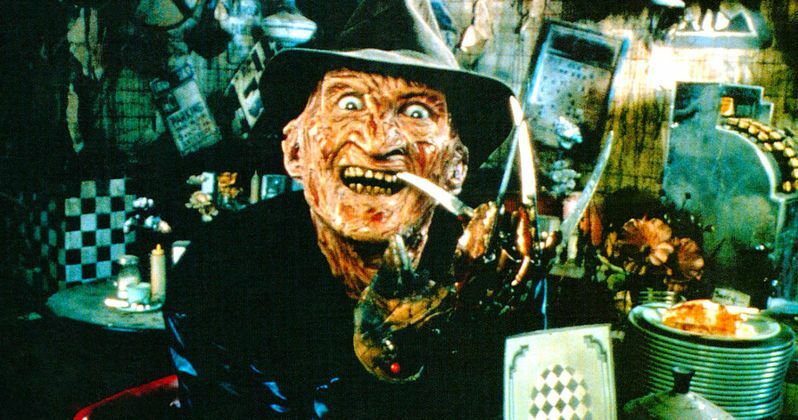 Nightmare on Elm Street was all set to have its very own reality television series hosted by none other than Freddy himself, actor Robert Englund in 2005, but it never saw the light of day. Now a contestant has offered up some photos from the set of this unaired show, giving us our first real look at what it would have looked like. The show was supposed to be like a horror version of Fear Factor and is rumored to have been canceled before it aired for being too similar to Fear Factor. The set photos for A Nightmare on Elm Street: Real Nightmares come to us courtesy of contestant Annette Sharp via HalloweenLove, giving the first glimpse of what the show might have been. Many of the photos are of Robert Englund behind the camera or in a makeup chair with plenty of pictures of cast and crew. Along with the photos, Sharp detailed her fear of heights and how the show helped her conqueror her fear. She explains. "After the show, I was a wreck. Every time I saw a building with a fire escape my hands shook and became cold & clammy. But there's an upside to this. My over-all fear of heights diminished to the point that I was actually able to climb the open staircase at the college library! Before, I was never able to go up the stairs to the book store. It was a complete disaster. The day I walked into the store, stepped onto the first step and walked to the top with ease, I knew it was worth it all!!!" Nightmare on Elm Street: Real Nightmares began when CBS sent out a casting call asking for video audition, with contestants told to vividly describe their nightmares and fears that may keep them up at night. Many contestants assumed that the show was Fear Factor, but we're either pleasantly surprised or let down when they found out that it was not Fear Factor. Robert Englund was to host and be a "dark guide for the dreamers" so that they could finally get a night's rest. Several episodes were shot, but none of them have ever been aired or seen. Real Nightmares was supposed to air in the fall of 2005 on CBS, but as previously mentioned, it was canceled before it could air for reportedly being too similar to Fear Factor. It's been over 12 years and still not one person has brought forth one of the episodes that was shot and all the information that we have comes from two former contestants sharing their experiences. Hopefully the unaired show pops up online sometime soon, it's been long enough. C'mon CBS, unleash it online. We need to see the contestant that is afraid of bulls get thrown into a maze with a minotaur by Freddy. It may be time to give Nightmare on Elm Street another shot. A new Fear Factor is rumored to be in the works, but the cultural landscape of 2017 might be more welcoming to Robert Englund making contestants face their fears. Plus, there's plenty of networks and avenues that the reality show can work with currently. Check out the official trailer for the show below and then head over to HalloweenLove to see all of the photos.